Koi carp is a recurring symbol of Japanese culture, highly appreciated by its decorative purposes. Its natural color mutations reveal their capacity to adapt, just like the Koi bathtub that you can use to create a better sense of space division in your ambiences. The Koi scales that compose the panels of the bathtub shine and reflect on its brass surface the sun caught throughout the clear water. Elegant gilt bronze soap holder in a bathtub style, France 1940. Excellent condition and quality. 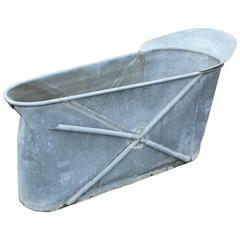 Italian neoclassic style (19th-20th century) painted metal bathtub with cross arrow design sides.